I thought it would be cute to make an I’m Thankful For Craft with my son. It is also a great keepsake to look back on together with your child when they are older. I traced Handprint Turkeys on brown paper and cut them out. 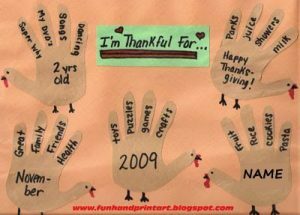 In the fingers, I wrote different things my 2 year old loves (and is most definitely thankful for!). On the turkey’s bodies I wrote things like how old he is nad the year. Another variation could be to place a handprint from each of the family members (pets too!) and write their name in their turkey with what they are thankful for.